I expected to hear chopped-and-screwed samples of slot machines when I logged onto Tinychat to check out the third incarnation of SPF420 fest last night. After all, producer and SPF420 cohost Chaz Allen (aka Metallic Ghosts) did tell me the online fest would be casino themed when I interviewed him for my B Side feature on vaporwave, an online microscene that received a hint of outside exposure for a series of sample-based albums that drew from chintzy 80s music. Since so many of the folks involved in that scene had a penchant for slowing samples down till they moved at a molasseslike pace I could only guess that a "casinowave" track might apply that process to the sounds of a night gambling in Vegas. 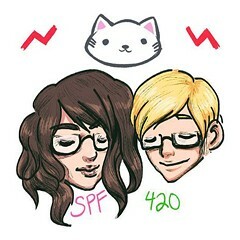 Yet the first thing I heard when I hopped on the SPF420 URL was the sound of Allen rapping in a rough cadence. Allen served as the house DJ for the night (which he did under the name Sugar C), and he was in the middle of preparing the crowd for the main event. Although I had met Allen in person it was a little difficult to recognize him in his video-chat window—he wore a red baseball cap that covered a big portion of his head, and the video stream tended to come in choppy. Allen's tiny video-chat window sat in the bottom right-hand corner of a much larger streaming video that displayed clips of women suggestively licking lollipops. Allen's preshow antics and DJ sessions between sets provided the most dynamic moments I witnessed during SPF420. That's partially due to Tinychat, a buggy site where the video often comes through pixelated; the chosen venue has an outmoded and nostalgic visual aesthetic that appeals to some of the folks involved in the vaporwave community, though many of the performances were static because of it. Allen navigated all those pitfalls like a pro, throwing basic visual effects—such as a mirror or twirl—atop his video-chat stream and dancing around as if he was in a club. At one point Allen lip-synched the intro to King Louie's "My Hoes They Do Drugs" and manically moved around like a Muppet as soon as Louie's verse kicked in. 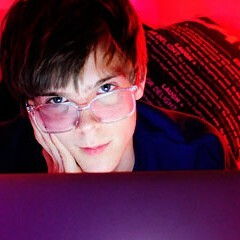 While Allen handled the limitations of Tinychat with ease, certain technical aspects prevented the night from going smoothly. The chat room was inundated with so many people—sometimes more than 300 at once—that the whole thing crashed at least a couple times. "I think we broke Tinychat," said Stress, the woman who cohosted SPF420 with Allen and claims to be from "IDGAF island on the Internet." She announced that for the first time around 9:14 PM via a voiceover that cut into the world premiere performance of Kodak Cameo, who played a set of "vintage" vaporwave tracks—insofar as anything as recent as vaporwave can be described as vintage. Later on in the evening at least one person with an interest in messing with the fest decided to hack into sets by Portland R&B duo Magic Fades and enigmatic producer DJ Paypal by plugging a video—which featured a shirtless dude in a Guy Fawkes mask giddily dancing to an abrasive and annoying dance tune—into the festival's display. The SPF420 administrators did their best to ban the faux-Anonymous hacker (or hackers), but every so often the responsible parties would log onto under a different name and the unauthorized video would come surging back to the fest's main display. Most of the attendees, though, seemed to come to the fest with the intention of having fun and spent the evening sending out snarky comments in the instant messaging window. There were jokes about vaporwave ("This is the Super Bowl of vaporwave") and seapunk ("spongebob = original seapunk"), jabs at the festival ("When is the music/video going to start. All I see is Vegas hotel videos and hear boring"), song requests ("play some DJ Nate"), and signs that this was a young crowd ("Anyone want to exchange GPAs"), many of which were delivered in grammatically broken, all-caps spurts. For the most part these messages read like private jokes among friends, but one particular comment struck me as true: "SMH if yr not listening to this thru laptop speakers." 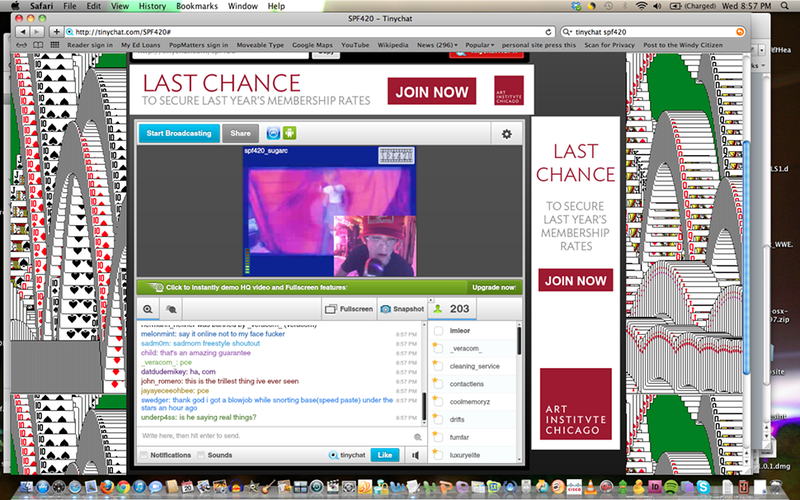 Tinychat's technological deficiencies extend beyond video—its sound quality is tinny at best. That didn't serve many of the performers well, particularly those acts that played ordinarily sumptuous songs such as Magic Fades and producer Blackedout; their sets sounded chopped and processed in a way that suggested they ran their outputs through a Blackberry speaker. High-fidelity obviously wasn't much of a priority for the SPF420 crew—having a democratized space to hang out, trade jokes, and experience each others' music was the main point, and in that regard the festival was a success. But after a couple hours it became pretty easy for an outsider like me to zone out, and by the time DJ Paypal's cloaked image appeared on Tinychat I was ready for a distraction. Although I stuck around till Vektroid took the, um, stage my brain was elsewhere, ready to move on to something else. That's one of the benefits of an online festival like Tinychat; if you're tired you can always retreat to the comforts of home and log back on when you're ready to give it your full attention. After running myself ragged covering SXSW, nothing could sound more appealing.